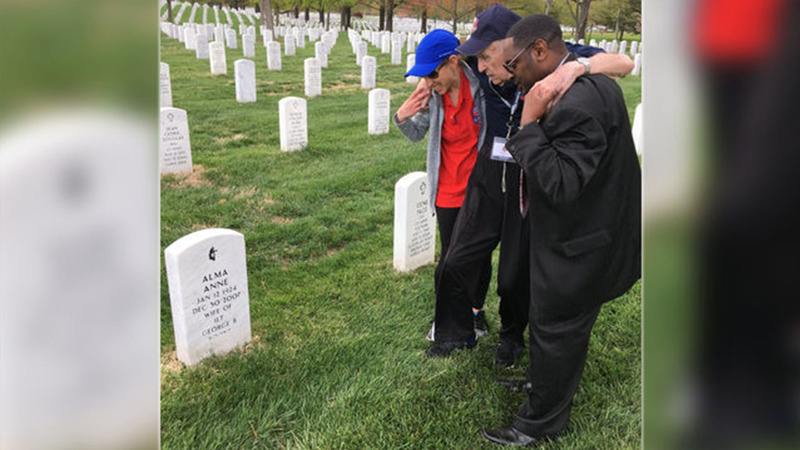 WASHINGTON, D.C. -- At 96, George Boone figured 70 yards was the closest he would get to his late wife's grave during a recent visit to Arlington National Cemetery. The WWII veteran lacked the strength to walk to her gravestone by himself but two good Samaritans stepped in to help. Boone, a former B-24 pilot who was shot out of the sky and held as a prisoner of war by the Nazis during his service, traveled to Washington, D.C. from North Carolina on an Honor Flight. Although a trip to his wife Alma's grave deviated from the planned tour, volunteers made sure George could visit the love of his life, who was laid to rest in April 2008, WSOC reports. As the group reached the site, Boone's son remembered he forgot something crucial. "I said, 'Dad, I forgot the wheelchair," Jon told CNN. "Do you think you can walk with assistance?'" While Boone said no, the volunteers refused to give up on the mission. After some quick thinking, they made a chair out of their arms and lifted Boone all the way to his wife's resting place. "He said 'This is my honor and privilege. I'm going to carry you. Wrap your arms around my neck. I've got you. And, off they went," Jon said about the volunteers. It was a gesture that left them men speechless. "Without a doubt, it gives you so much pride to be an American," Jon said. "It's not all what we see on the news. There are incredible people out there waiting to do good things and show acts of kindness."